This is an area that was hit by Typhoon Frank, the deadliest storm to date in the Philippines. Over two thousand people died. It’s not far from were the big ship capsized. The cargo is a poison fertilizer. If it is not recovered, the fish in this entire region will be poisoned. 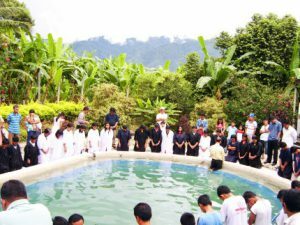 45 precious souls baptized in South Western Mindanao Mission. 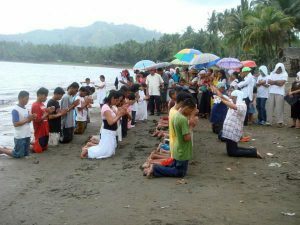 Prayer time on the beach. This is a solemn moment. 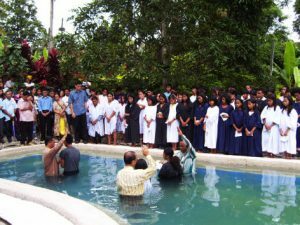 The Newly Baptized people go through tough times in their homes. Some people will lose their jobs today. Some may be beaten, some maybe evicted. They need the strength of the Holy Spirit to carry them through the trials ahead. Often, families are broken up because of this important decision to be baptized. Please keep these people in your daily prayers. Baptism in a pool. With only 3 Pastors this took a long time. 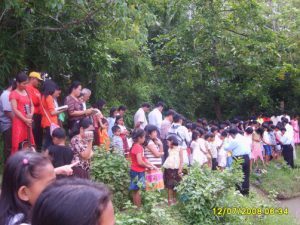 Notice many of the women are holding a cloth to cover their mouth and nose to prevent water from entering there. This entire region is under a cloud. Peace talks that have been going on for over 20 years have broken down. A major agreement was initialized that would resolve the whole conflict and give much more land to the Moros like the Indian reservations in the USA. But the government is unsure if they will proceed. Both sides are tense and more violence and killing have resumed. 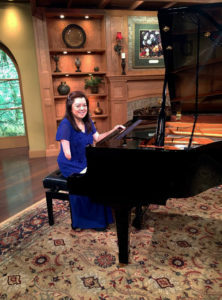 Please pray for a resolution to the conflict here. It seems that an agreement is very close.